Or view larger version. Untitled. 1935. Dorothea Lange. Gelatin silver print. Collection of Oakland Museum of California. Gift of Paul S. Taylor. 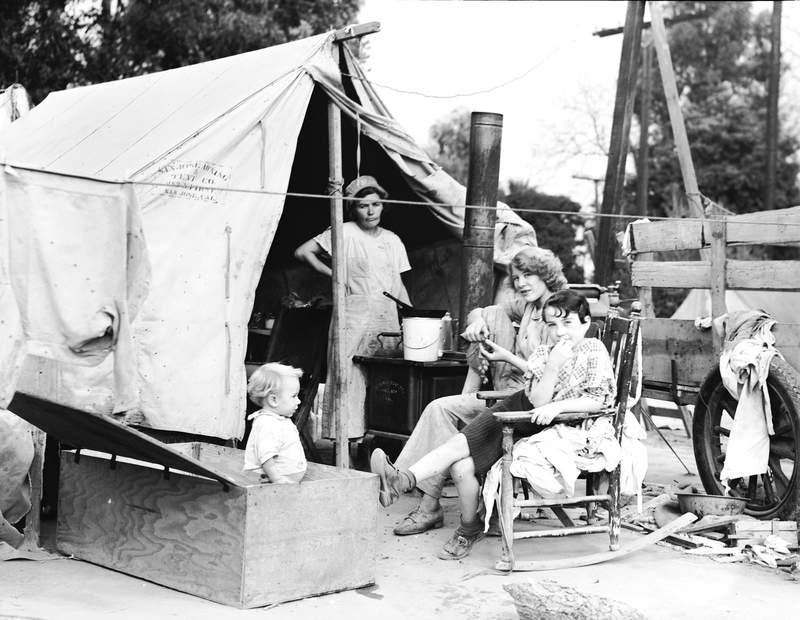 This is a photograph of a Depression Era family and their family tent. The migrants of the Dust Bowl had no home to claim as their own in California, so they pitched tents along irrigation ditches or on the side of a road close to a spring of water. Some built houses out of available materials, such as corrugated paper which they would tack to a wooden frame. Most camps had no toilets and no clean water, which caused alarm among public health officials. Outbreaks of smallpox, tuberculosis, malaria, and pneumonia were common in the camps.